PHYSIOTHERAY EQUIPMENT In choosing a clinics must choose a sturdy one which can withstand frequent usage of patients. Therapies do not happen in just a blink of an eye. It requires multiple sessions before the treatment is completed. TREATMENT TABLES Heavy-duty tables for treatment are a requirement for clinics since physiotherapists must ensure injured patients are comfortable. Injuries can be delicate thus one wrong move in positioning the patients can add further damage on their trauma. Thus, sturdy treatment tables should have high-quality paddings to properly support patients. ELECTRICAL MUSCLE STIMULATION The lack of activity in the injured area causes muscle atrophy. This means that the muscles in the injured begin to deplete which makes it difficult to move the injured arm or leg around after treatment. Thus, undergoing Electrical Muscle Stimulation is required at the early stages of treatment to prevent this from happening. EXERCISE BIKE AND BALLS Typical gym equipment such as exercise bikes and balls are essential in physiotherapy. Exercise Bikes are best for treating injuries on the leg, foot and ankle. While Exercise Balls are good for bringing back as well as the balance and coordination of the body. 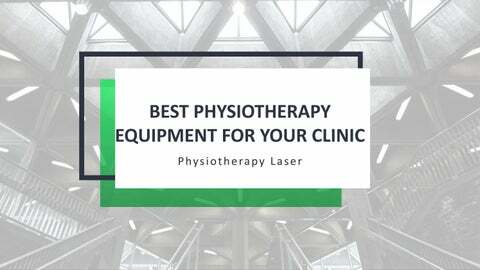 PHYSIOTHERAPY LASER Aside from common Physiotherapy Equipment, there are complex apparatus to further enhance the rehabilitation process. These are Physiotherapy Lasers or also known as Pain Relief Lasers. FISIOLINE CPS (CONTINUOUS, PULSED AND SUPERPULSED) This involves the use of Physiotherapy Lasers to help reduce inflammation of the injured area. Its lasers provide pain relief on injured patients because of its “pain therapy antalgic effect”. It is an effective Post Traumatic Sports Medicine because it helps relieve the pain on injured areas, as well as help, treat physical trauma. Physiotherapy Equipment Suppliers in Singapore provide the right apparatus for clinics to help a faster recovery of injured patients.